Maybe I do like it? I'm not sure. I don't want the room to look blue. Maybe I should just paint everything red, put some red lace over the windows and call it my 'Lady Gaga' room? At least all the trim is painted. Please don't dwell on the fleshy doors, I know they look terrible. That is another I hate the previous owners of this house project for later. What say you, decorating divas? Mix and match different grays and hope for the best? Find new fabric with a gray background that I really love?? After all, I'd only be out 5 bones and could find another use for it for sure. Give me your thoughts! ps - thank you to Jamie for the gray paint samples! She's undergoing a little paint dilemma of her own, all part of her huge home renovation. Progress pics of her place are coming soon! there. I used the leftover in my bathroom and the lighting in there gives it an almost purplish cast. I recommend trying all of your samples on all four walls to get the best idea of how they will look. would painting the room yellow be a terrible thing? Honestly, I think the L-shaped one looks good! It doesn't "match" but it doesn't need to. They're just two shades of gray and I actually think they compliment each other quite well. My vote is Dolphin Fin! I like the color matched gray, but I also love blue so I wouldn't have any problem with a blue room. Good luck! I wouldn't try to match it exactly. I agree with Amanda, go with the Dolphin Fin! When I was picking out curtain fabric for my many different shades of white kitchen, none of the white background fabrics looked right; too dingy, too bright, too yellow... I finally went with a gray and lime green fabric with slight touches of white and it looks great! Well, I think so. My fiance thinks the fabric looks like pajama pants. Oh, well. You know what, I like the 'L'-shaped, Dolphin Fin swatch best, even with the fabric. It doesn't match, but that's a good thing. Coordinating is MUCH nicer than matchy-matchy. They go nicely together, and that's all that matters. One thing I noticed when testing gray in my house is that the current wall color can play tricks on you. My walls were yellow when I tested my colors and they all looked way too blue. 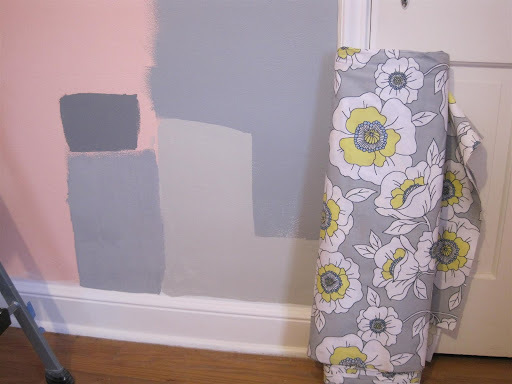 After I primed a large section white and tried another test, I was able to get a better idea of which gray looked best in the room. For what it's worth... I used Dolphin Fin in my house and love it :). I would maybe opt for another fabric. You could definitely find another use for the fabric you bought. I love the dolphin fin color. It's fabulous. hmmm... this is a hard one. (that's what she said) I also like dolphin fin the best. Can you paint a larger section of it, maybe that will help you decide? LOVE the fabric!! 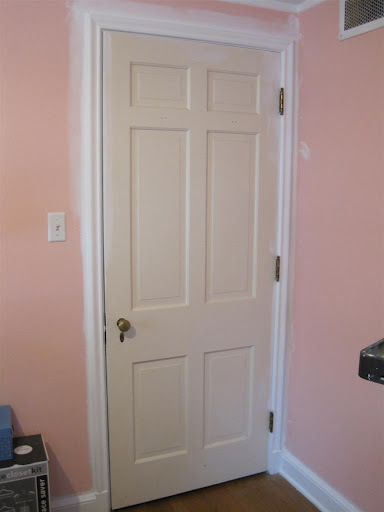 We also had fleshy trim and doors in our house when we moved in! I just loved repainting it all... NOT! I like the colour matched grey ... I think it is reading blue because it is next to the pink. It looks great with the fabric ... and it appears there is a bit of blue in the flowers. Love the fabric too ... and what a deal!!!! Second choice would be the dolphin fin ... it would make the room lighter and the paint doesn't have to be matchy ... it just has to co-ordinate. I actually really like the dark grey. Do you happen to have picture rails? If you painted the bottom part of the picture rails the dark grey, the top of the picture rails a half strength grey, and all the trim and the actual picture rails white, it would look awesome. Otherwise, why not just go the dark grey at half strength? The others all seem too matchy for my liking. DEFINITELY the Dolphin Fin. The others just don't go or are too matchy matchy. The Dolphin Fin is neutral but still goes. I think the pink is throwing you off. I like the color matched color and the dolphin fin. Love the fabric and am wishing I could find those great deals at our fabric store. WTH? Well, the Dolphin Fin is definitely the least "blue" out of all these. And the others may seem even darker once all of the walls are that color (but maybe you'd be okay with that). I do agree that maybe you should try painting a larger section, if you have enough of the sample left. I'm not much of a painting expert (yet), but I'm sure you'll make a great decision! The pink is making it hard. I'd go for the Dolphin Fin or the color match. I lean more towards the Dolphin Fin. I have an idea, but I am not sure if you will dig it. What if you did the walls a real real real light gray...almost white, then did the ceiling in a little more darker gray? I think the contrast would be awesome and would really draw your eye up! Danielle - interesting idea! Although painting the ceiling again makes me want to cry. It probably won't happen. All - Thanks for all your ideas, I'm thinking I will use Dolphin Fin or something similar. I'm heading to Benjamin Moore store today to try out a couple more. Because I need more insanity! It's so hard to find the perfect grey! I'm feeling your pain, i wnet though the same thing with our bedroom, found the perfect grey. as for the colors you choose, I like 'Behr Dolphin Fin' It's so pretty!!! 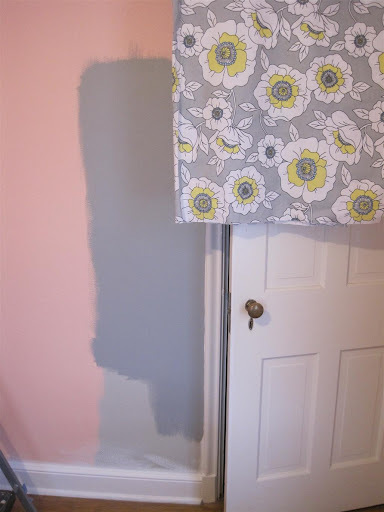 It looks like a good balance on the curtains and not to matchy matchy...hmm, paint the Delphin Grey in another area and hange the fabric lenthwise and watch it foe a few days in various lights..
just save the fabric for another project and find another one you love. I think yellow would be fabulous too to go with the flowers on the curtains! but if you're wanting to stick with grey...i think slightly darker would be better to offset the light grey of the curtains :) good luck! I love the fabric-I say keep it. If you're looking for the exact gray in the curtains take them to the paint counter. They can match the color exactly. If I remember right, I think Home Depot does the best job. Good luck! That fabric is amazing! Love it...and I think you can definitely mix and match some grey tones in there and that would actually help it look not blue. I can't wait to see the finished room!! i really like the dolphin fin (alone or with the curtains) or perhaps a shade lighter of the dolphin fin. i'm a big fan of gray shades, but the purple/blue problem has always kept me from putting them in rooms. i vow to have a gray room one of these days! I think maybe painting it a light yellow would complement the fabric, instead of looking too matchy matchy. But I'm sure it will look great whatever you choose! I think either of the greys could work and I actually like the color matched one. The curtains are very cool and a steal! Shut UP, this is your "closet"?!! It's every girl's dream to have a whole dressing room. It's exquisite! My eyes are jealously drinking in all of the elements: the enormity of it, the rainbow of clothes, the beautiful rug, the chic bench (& the capiz chandie I saw in the later post).